Smart glasses in healthcare were a hotbed of startup activity just a few years ago, but the trend seems to have fizzled out. Smart glasses company Vuzix and telemedicine technology supplier VSee have teamed up to create a smart glasses offering for telemedicine, the two companies announced today ahead of the American Telemedicine Association conference. The product will be a HIPAA-compliant software offering for Vuzix's M300XL and Vuzix Blade Smart Glasses, with potential applications for first responders, telesurgery and medical training. "For this initial solution, VSee will be offered as an telemedicine video app that can be purchased for doing secure, health-related video visits and consultations," a spokesperson told MobiHealthNews in an email. "For example, a provider wearing the smart glasses can use the telemedicine video app to do a live telesurgery procedure or ultrasound training. Conversely, a medic or paramedic could be wearing the smart glasses while examining the patient, with the provider at the remote end directing and correcting." Vuzix is generally considered to be one of the leaders in the AR glasses space, which has continued on since the consumer failure of Google Glass, albeit with a lower profile. And VSee, while something of a background player, is still a big name in telemedicine — its technology powers telemedicine offerings from MDLive, Walgreens, McKesson and a number of large healthcare systems like Ascension and and Sutter Health. It also exclusively powers video conferencing between Earth and the International Space Station. "While VSee previously worked with some early generation smart glasses solutions, the technology was not ready for telemedicine," VSee CEO Milton Chen said in a statement. "We feel very privileged now to be partnering with Vuzix with its mature smart glasses offerings. Telemedicine video conferencing through smart glasses from Vuzix is a natural progression from tablets and computers for our customers. 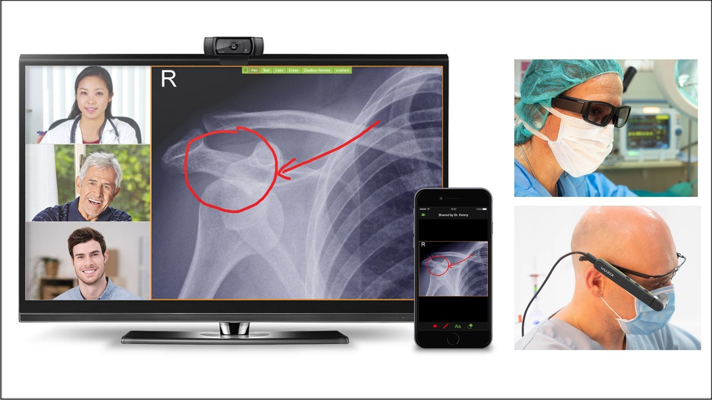 We are excited to begin realizing telehealth smart glasses applications from remote training on imaging technology (CTs, ultrasounds) and inserting IVs to telesurgery to AR-enhanced video visits. We look forward to continued collaboration between our two companies." As Chen alluded to in his quote, Vuzix has been here before. In 2016 the company partnered with Pristine, at the time one of several startups tackling applications for smart glasses in healthcare. Pristine was quietly acquired the following year by Upskill, an enterprise AR company that does not include healthcare as one of its target industries. Augmedix, one of the other prominent startups in the space, is still in operation but has shifted its focus to a different healthcare application of smart glasses: providing a remote digital scribe to give doctors more face time with patients. In fact, the whole once-crowded field of AR healthcare companies has either pivoted heavily (CrowdOptic, Yosko) or appears to have shut down (Wearable Intelligence, Remedy). While this partnership could herald a return to relevence for the space, it may be an uphill battle. This isn't the only indication of a resurgence of interest: Netherlands-based 1minuut Innovation launched an AR telemedicine platform last fall called Genzõ, also in partnership with Vuzix. "The VSee telemedicine video conferencing platform is easy and simple to use," Paul Travers, president and CEO at Vuzix, said in a statement. "We are excited to offer a telemedicine video conferencing smart glasses hardware option to our existing customers, first responders and to VSee's extensive telemedicine customer base."